Hazon’s Betzalel’s Workshop – Jewish Ritual Craft Making Project is helping people connect viscerally, directly, and in an unmediated way with Jewish tradition, patterns, and cycles. 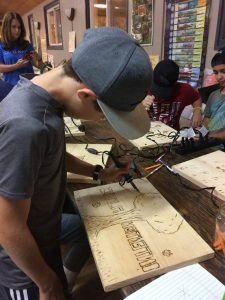 Hazon is engaging the creativity and passions of children who participate in Teva, Hazon’s Jewish outdoor experiential education program, by developing and offering a series of ritual craft making workshops. Students create ritual objects by hand with natural materials such as glass, wood, metal, textiles, and other local or natural materials. Workshops take place in the art studio located at the Isabella Freedman Jewish Retreat Center, a center that has 5,000 visitors annually. Hazon is also developing accompanying written lesson plans for teachers to use at their own schools. These plans are available on Hazon’s website and below.